It is well-known that a number of Palestinian factions fight on the side of the Syrian government in the civil war. Quwat al-Aouda ("Forces of Return"- قوات العودة) is notable as a Palestinian faction affiliated with Hezbollah. 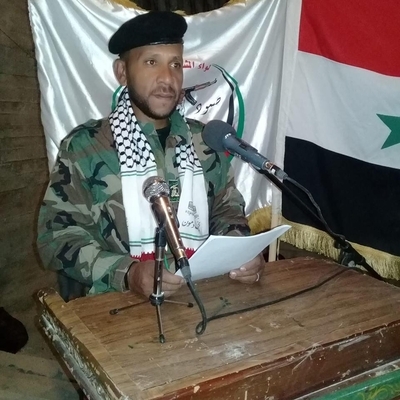 Overnight on 10-11 August 2018, I interviewed Abu Dhikra, the field official for the group. Any explanatory insertions are in square brackets. Q: First, when was Quwat al-Aouda established and what was the idea behind establishing it? A: It was established in July 2015. The idea was to bring to together all the Palestinian youth present in Syria, first to help the Syrian brothers against terrorism, and from there to work to return to Palestine, because the forces are Palestinian only. Q: Yes. Of course the forces are affiliated with Hezbollah. So all the training, financing and arms are from the Islamic Resistance? A: We are an indivisible part of the Islamic Resistance. Yes, of course. Q: Yes. But Hezbollah has helped in training and arming some of the other Palestinian factions right? For example Fatah al-Intifada and the General Command [PFLP-GC]? So what is the difference between you and these factions? A: The party [Hezbollah] provided aid to the factions but Quwat al-Aouda was established by Hezbollah. Q: Yes. But in political program there is no difference between you and the other factions? A: We are a resistance project for the sake of the right of return and putting an end to the Zionist enemy. Q: Yes. On which fronts has Quwat al-Aouda fought? How many martyrs does it have until now? A: From the beginning in Aleppo, East Ghouta, Palmyra, Deir al-Zor, Suwayda' and Deraa. The number of martyrs is 5. Q: Yes. Did you participate in the liberation of the Yarmouk Camp? A: The participation was indirect, because we were entrusted with work in the Albukamal area. Q: I see. Regrettably there was a lot of looting in the Yarmouk Camp after the liberation. What was the reason in your view? A: The issue of looting is a red line with regards to the forces. Q: Yes. But it seems that it was a big problem in the camp after the liberation. A: Yes, of course. On account of this, the party [Hezbollah] stayed out of the matter of the camp. Q: You mean that it was expected that there would be a lot of looting in the camp, therefore the party did not participate in the operations directly? A: No, not necessarily, because reconciliation was carried out in the camp. Q: I see. So what do you mean when you say the party stayed out of the matter of the camp? A: There was greater work than the camp in other areas. Q: Yes, I have understood you. What is the forces' opinion about the Hamas movement and Fatah in occupied Palestine? Are these factions traitors to the Palestinian cause? A: This is something well-known among all the Palestinians. Q: Yes. For the only solution currently is a new intifada against the Zionist occupier? A: Of course of course. There is no solution besides this. Q: Yes. Of course some of the Palestinians outside Syria accuse the Syrian government of bombing and killing the Palestinian people in Syria. What is your response to this talk? A: The one who has not lived in Syria does not know what is Syria. All the Palestinian people have been living a dignified life. And what happened in Syria was primarily to make the Palestinian cause disappear. Q: Yes. And the one who does not stand with the Syrian government is a traitor to the Palestinian cause? A: Of course. Syria offered a lot for the Palestinian people. Q: Yes. Can you tell me a little about yourself? A: I am among the inhabitants of the Jaramana camp, living in the camp. I am married with 4 children: three girls and one boy. I worked in 2014 with Fatah al-Intifada in the Yarmouk Camp. I continued my work until Quwat al-Aouda was established. I am among the founders of the forces. Q: There remains one question but I understand if you cannot answer the question. Of course many of the resistance factions are going to Albukamal for special assignments. What is the strategic importance of the area? A: The Albukamal area lies on the banks of the Euphrates and is very rich in the matter of oil wells. And the insurgents who were [there] were from the elite so this thing requires people who know how to fight. Q: Yes. But of course there is much talk that the resistance wants a land route between Iraq and Syria. Is this true? A: Yes Iraq is a friendly state for Syria.